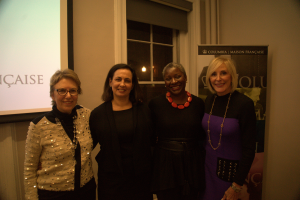 On Wednesday March 13, 2019 days after International Women’s Day the Center for the Study of Social Difference’s Women Creating Changed hosted a roundtable discussion to explore the successes and limitations of policies to promote diversity and inclusion in the corporate sector. Held at Maison Francaise, the “Corporate Feminism & Its Discontents” roundtable included notable speakers such as Janice Ellig, Chief Executive Officer of the Ellig Group, Professor Yasmine Ergas, lecturer and director of the Specialization on Gender and Public Policy at the School of International and Public Affairs, Melissa Fisher, a cultural anthropologist who writes on finance, feminism, and the workplace, and Katherine Phillips, the Paul Calello Professor of Leadership and Ethics at Columbia Business School. The interdisciplinary panel was introduced by Women Creating Change Leadership Council (WCCLC) Chair Ann Kaplan, Chair and founder of Circle Financial Group. Moderator of the roundtable, Janice Ellig, started off the conversation by detailing her first hand experiences in corporate America and how these experiences inform her belief that a shift toward gender parity needs to happen from the top. She also recognized the impact of women leaders like Diana Taylor, new WCCLC member, who has served as a leader on the issue of women entering into the corporate world and the necessity for such committed leadership to promote and advance the rights of women in the corporate field. 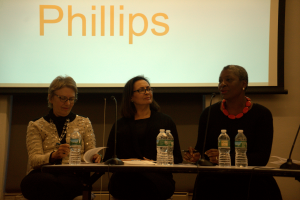 Through an interdisciplinary look at both the progress and regress in the field, the “Corporate Feminism & Its Discontents” roundtable discussed the achievements made by women in the corporate sector in recent years, and shed light on the existing gender and racial disparities in the sector, especially in its higher echelons, which remain significant in the United States and Europe. During her presentation, Melissa Fisher addressed the critique of corporate feminism as not addressing race and class. She questioned how the relationships between capitalism and feminism work themselves out in everyday life and cites different dimensions that need to be looked at and pushed: equity, social imagination, and forging alliances. Fisher ended by highlighting the benefits of looking at feminism as an assemblage, both mobile and connective in order to mobilize it in novel ways. She concluded with optimism in the way labor is bridging boundaries and translating domains.